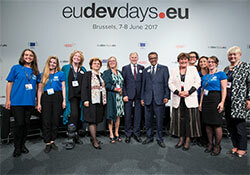 In his keynote speech during the EDD high-level panel on reducing health inequalities through global partnership and collaboration, organized by WHO/Europe, Dr Tedros underlined that “accelerating the growing international movement for universal health coverage will be my number-one priority as Director General”. He reiterated his commitment to working with the EU at European and global levels. Dr Tedros took office as WHO Director-General on 1 July 2017. He stressed that “universal health coverage is an essential pillar of sustainable development … every $1 spent on health yields up to $20 in full-income growth within a generation”. Dr Tedros also reminded the EDD audience of the 40th anniversary of the Alma-Ata Declaration, signed in 1978. The Declaration identifies primary health care as central to achieving health for all. He added that in all the debates during the formulation of the Sustainable Development Goals, it became increasingly clear that good health is both an outcome and also a means to development. Health for all should be placed front and centre in all development efforts, since “if there is no health, there is nothing”. In his intervention at the high-level panel, EU Commissioner for Health and Food Safety Dr Vytenis Andriukaitis wished Dr Tedros “every success on his appointment”. Commissioner Andriukaitis emphasized that “the Commission stands ready to cooperate closely with you and support WHO’s leadership in global health”. WHO Regional Director for Europe Dr Zsuzsanna Jakab accompanied Dr Tedros during his 2-day visit to Brussels. Dr Tedros met with EU leaders including Commissioner Andriukaitis; Ms Federica Mogherini, High Representative of the EU for Foreign Affairs and Security Policy and Vice-President of the European Commission; and Mr Neven Mimica, Commissioner for International Cooperation and Development. He also met with African leaders including President of the Republic of Rwanda Mr Paul Kagame and Vice-President of the Republic of Côte d’Ivoire Mr Daniel Kablan Duncan, and with SDG advocates including Professor Jeffrey D. Sachs and Dr Alaa Murabit. Additionally, Dr Tedros met with Belgian representatives including Her Royal Highness Queen Mathilde of Belgium, Belgian Minister of Health and Social Affairs Dr Maggie De Block, and Deputy Prime Minister and Minister of Development Cooperation Mr Alexander De Croo. EDD is a forum organized each year by the European Commission to bring the development community together to share ideas and experiences.